This synagogue in the heart of the Old City, on Shimon Bar Yochai Street, is very popular with young people for Kabbalat Shabbat. Although there is no minyan there during the week, it is taken over on Shabbat by the yeshiva crowd. They enthusiastically welcome Shabbat in with song and dance. Often seen as an alternative to the Beirav Carlebach minyan, it appeals to those who are already observant, rather than the merely curious. This shul is called after the Chassidic dynasty that came from the town of Makarev in the Ukraine and which was decimated during the Holocaust. The dynasty was an offshoot of the Chernobyl dynasty of the well known Twersky family. The Makarev Chassidim were known for their compositions of niggunim (tunes) many of which have now been lost. The Rebbe himself was an extremely gifted composer. One famous chazzan, Zed'l Rovner, owed his singing career to the Rebbe of Makarev who spotted his talent and insisted that he organize a choir and become a chazzan. Another famous singer, Efraim Zalman Rozumni, who was known for his sublime improvisations, was also indebted to Makarev Rebbe. In a recent sale of Judaica there was a book with a kabalistic commentary on the Torah with a stamp from the "Makarev Beit Midrash" together with marks from "Abraham Leib Silberman" and "Rabbi Refael Silberman, Grand Rabbi of Safed". This may show that these two important local Rabbis studied in the Makarev study hall. To makarv someone in Hebrew means to bring someone close, so the shul is coincidentally very appropriately named. Rabbi Rafael Weingot who runs the Shalom Rav yeshiva, which is a yeshiva to bring people closer to Judaism, brings his yeshiva students every week to pray at the Makarev for Kabbalat Shabbat. Although it is not a very large space, it can hold between 65 and 80 men singing and dancing. Everyone gets into the spirit of the prayers inspired by Rabbi Weingot's joyful welcoming of Shabbat. Also perhaps the singing and dancing are inspired by the spiritual ancestry of the Rebbe of Makarev. On Shabbat day, of course, the services are the usual regular yeshiva style dovening. Upstairs in the newly refurbished women's section, the seminary girls can look down on the yeshiva bochurs below. Although it is usually very packed no one minds and it is a very social as well as spiritual affair. There is almost no room to stand for the 50 or more women who come, never mind sit, and the enthusiasm is palpable. Often you can see the young women, often newly married, standing on the staircase trying to get inside. Women also stand outside on a Friday night with their baby carriages waiting for their husbands to leave. Shacharit: 8.00am or 1 hour before the time of saying the Shema. 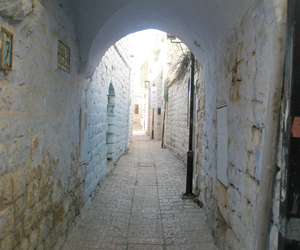 Don't forget to look at the rest of our site for more information about other synagogues and interesting places to go in Safed.